Terry Bradshaw was the face of football for many years during the Pittsburgh Steelers Super Bowl dynasty of the 1970s. As a longtime host of Fox's NFL show, he continues to be a beloved figure in football. 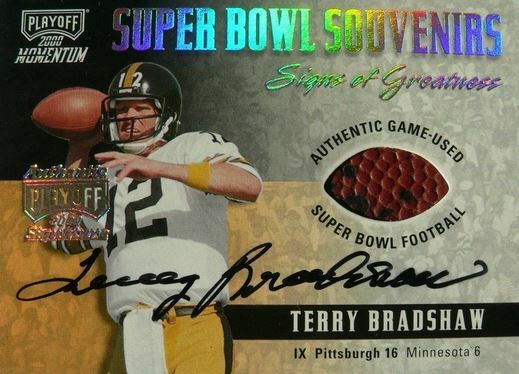 As such, Terry Bradshaw cards and autographed memorabilia still remain popular with collectors and fans, particularly those that bleed black and yellow as part of the Steeler's Nation. Selected with the number one pick out of Louisiana Tech in 1970, his cardboard debut came in 1971 Topps Football. 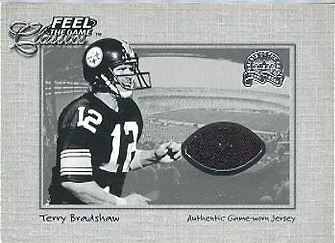 That year, Bradshaw had two other cards released, although because of their regional distribution, neither are considered to be official rookie cards. Player and team collectors do consider them important however, when talking about early Terry Bradshaw collectibles. The first of these is the 1971-72 Dell Photos #6 and the other being the 1971 NFLPA Wonderful World Stamps #319. A willing signer throughout his playing days and a frequent member of the autograph circuit, there is no shortage of Terry Bradshaw autographs. However, due to his incredible popularity, demand remains strong and, therefore, so do the values. Items signed during his playing days including balls, jerseys and commemorative championship pieces do carry a premium. Game-used material from his carry command top-dollar at auction. 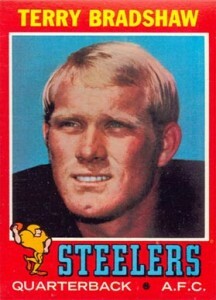 The Terry Bradshaw rookie card is presented with a striking contrast of vibrant colors, with the red border and the blue of sky in the background. It is iconic and well recognized within, and even outside of, hobby circles. The bold block lettering of the team name and dynamic yellow of the player name all combine to form a card that truly captures your attention. The condition-sensitive nature of the red borders means that they are prone to chipping, edge and corner wear. As a result, high grade versions command a super premium. 30F-1 1972 TOPPS TERRY BRADSHAW FOOTBALL CARD, CORNER DAMAGE ON 3 CORNERS. 1975 Topps #75 Terry Bradshaw - Pittsburgh Steelers, Ex - Mint Condition! A look at early Terry Bradshaw autograph and memorabilia cards reveals that his first autograph card was actually a part of a food promotion held by Tombstone Pizza in 1995. An extremely limited quantity of signed cards were randomly inserted into the packaging. However, it wasn't until 1997 that Bradshaw had his his first officially licensed trading card. In 2000, Playoff produced several cards containing swatches of game-worn material of the Steelers legendary quarterback. Many of these cards paired Bradshaw with teammates like Franco Harris or contentious rivals like Roger Staubach. In that same year, Fleer and Upper Deck each produced a single memorabilia card of Bradshaw as well. A handful of memorabilia cards also include a Terry Bradshaw signature, some with print runs as low as 21, making for a truly rare and treasured collectible. The Sign of the Times autograph card is limited to 100 total copies. Bradshaw also had a base card autograph version in the set as well. They rarely make it to the secondary market, safe in the hands of die-hard Steelers collectors. This is by far, Terry Bradshaw's most accessible first year jersey card. While others may be more limited, this is a card every collector can afford from this legend of the game. The black and white color scheme works to the card's advantage and showcases a small jersey swatch inset within a die-cut football. All the elements combine to produce a very nice looking card. At the opposite end of the affordability scale is this classic from Donruss/Playoff. Featuring an on-card signature and authentic game-used Super Bowl football relic, it is serial numbered to just 25 copies. However, Bradshaw does have a similar card in the set, with each commemorating a different Super Bowl, and it too is numbered to just 25 copies as well. Terry Bradshaw 2018 Panini Playoff Patch 32 50! RARE! Below you will find examples of what an authentic Terry Bradshaw autograph looks like. This can be used as a first point of reference for determining the legitimacy of autograph memorabilia, but is not a substitute for having your items authenticated by a well-respected professional autograph authentication company. Some of the trusted sources within the sports memorabilia market include the following companies: PSA, JSA, Steiner, Tristar and Mounted Memories. Click on any of the images below to view full size photos. A fairly legible and even handed signature written on an even horizontal plane. The use of cursive script makes many of the letters look the same. The defining characters are the "T" which looks like the numeral "2" and the "B" which looks more like a capital letter "R."
The "y" in Terry includes a small open loop at the bottom of the letter. The "d" in Bradshaw is awkward looking and forms a small oval. The "a" is slightly open and the "w" is distinct.